For the first time, I feel truly hesitant to write about a film I’ve unexpectedly loved. Certainly not because it is lacking in any way. Not even because its ‘forgotten’ status has diminished due to the superhuman rise of one member of its star-studded cast. No, my hesitance comes from the fear that I could probably never do it the justice that it truly deserves. Sunshine is a science fiction film directed by Danny Boyle, about the last-ditch attempt by humanity to restart our dying Sun and save all life on Earth, by sending a specially designed ship to deliver a gargantuan explosive payload directly into the heart of the star. Sunshine is classified as ‘hard science fiction’, but I contest this. It is science fiction, it is horror, it is drama, it is art…it is a harsh stare at Humanity in all its arrogance. In short, Sunshine is a masterpiece that transcends labels; when faced by the sheer genius and beauty of the cinematography alone, I don’t think I can give any lessor accolade. I am trapped by the majesty of art portraying the ship and the Sun. Our insignificance in the face of a star is poignantly driven home and repeatedly underlined by one of the most heart-wrenching scores I have had the privilege to hear. All is encapsulated by the absolute silence of space. Watching the interactions of the crew in the first act juxtaposed with the ship’s slow but steady progress to her goal, a sentence keeps racing through my mind: “In space, no-one can hear you scream”; the certain knowledge that something is about to go terribly wrong. Having passed Mercury, the crew encounters the ship that had originally attempted their mission and failed. The dialogue has neither fat nor flash – a verbal display that precisely mirrors the austerity of their environment. Every word is measured, every word is necessary, and I see what I hadn’t noticed before: every frame, every note, every word, every expression is precise. Nothing is redundant in Sunshine. The decision to board the stranded ship starts a rollercoaster of misfortune, and this is where the true genius of this film presents itself. This is not an action film in the traditional sense of the word, and yet my heart is racing, and my palms sweat as I realise that they might actually fail. I have somehow been manoeuvred to accept the possibility of the ultimate death of all life as we know it. Feeling 100% invested, I am praying that they somehow manage to succeed. The film’s cast is striking in both diversity and talent, but what amazes me is the size: there are no extras and, with the exception of the final scene, no cameos. Hiroyuki Sanada, Cliff Curtis, Cillian Murphy, Chris Evans, Michelle Yeoh, Rose Byrne, Troy Garity, and Benedict Wong comprise the entirety of the ship’s crew. Mark Strong portrays the captain of the failed first mission, and the ship – herself an important but invisible character in this play – is voiced by Chipo Chung. Watching Sunshine again, I get the unshakeable feeling that each of these actors was handpicked to perform exactly the role they are in, much as one would carefully select an actual crew for a space mission. But at the same time I know that they could have been replaced – that the people they are portraying are facets in the gestalt of humanity. The captain (Sanada) leads with a quiet calm, unafraid to make the ultimate sacrifice for the success of his mission. The comms officer (Garity) represents that selfish self-preserving dark spot in man’s psyche. The ship’s engineer (Evans) is the passionless and logical voice of reason, which knows that sometimes the most painful route has to be taken for the greater good. 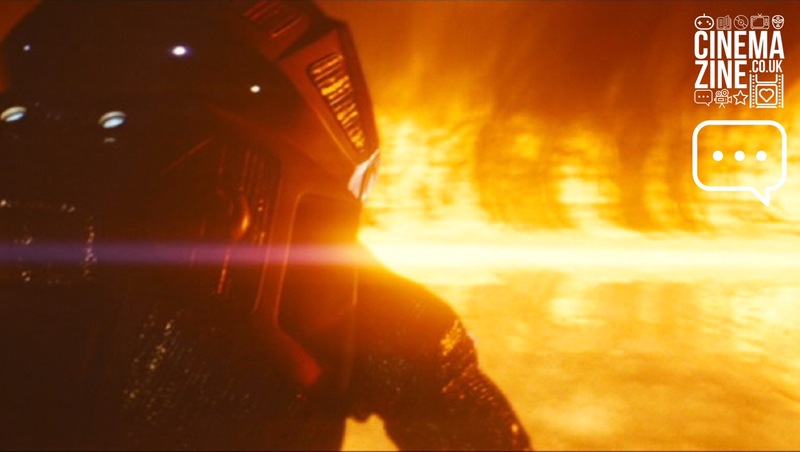 The ship’s psych-ops (Curtis) embodies our precarious relationship with the Sun as both destroyer and life-giver, in his break towards outright worship. The biologist (Yeoh) is the nurturer, placed in charge of the life support systems to ensure they survive long enough to get to the sun and back. The pilot (Byrne) is an optimist, the voice of hope; while conversely the navigator (Wong) is despair. All of these archetypes would be pointless without the physicist (Murphy), the only person who can calculate the exact trajectory and speed that the bomb must enter the Sun to save Earth. Because in the end, when all else is lost, he is that spark that keeps us putting one foot in front of the other. Sunshine is a bag of paradoxes: it is the stunning beauty and lethal void of space; it is the evil, and redemption of our species; it is science, and it is religion; it is Man’s swan-song, and his birthing-cry. Ten years after release not only does it hold its own against the franchise giants of the genre, but it can still make me weep in absolute despair as Man’s last hope of survival spirals out of control. Sunshine deserves a constellation in the star-map of film-making.